Recent progress in the cognitive neurosciences has greatly advanced our knowledge of how brain function underlies behavioral performance. However, there are inherent limitations in the methodological and analytical approaches utilized in the vast majority of research efforts to date in the human sciences, including those in cognitive neuroscience. These limitations, which are encapsulated in the Technical Barriers identified by the CaN CTA (see right text box), have resulted in an understanding of how the human brain works in highly-constrained tasks performed in highly-controlled laboratory settings. In turn, this has meant that previous systems development approaches and methods for technological advancement cannot adequately account for the capabilities and the limitations of the neurocognitive abilities of Soldier operators. The scientific vision of the CaN CTA, therefore, asserts that to address critical Soldier needs, Army neuroscience efforts must be able to provide and leverage a clear working understanding of how the human brain functions when faced with real-world tasks in real-world operational settings. This vision is derived from well-established theoretical foundations in ecological psychology and concepts of embodied or situated cognition, which argue that it is literally impossible to understand natural, motivated behavior in artificial scenarios that divorce the individual from their context. Success within this approach, in turn, is envisioned to lead to the establishment of principles on which to base advances in neuroscience in terms of the translation of fundamental research to military relevant domains; that is, to establish and articulate fundamental translational principles. These principles can guide the development of technology solutions that work in harmony with the capabilities and limitations of the human nervous system as situated within its dynamic, complex environment. The skilled cognitive and sensorimotor performance that underlies effective mission utilization of advanced technological capabilities is clearly organized at the level of the nervous system. In particular, technological advances in sensor deployment, automation, and communications bandwidth will intensify the information processing demands placed on the Soldier. Mission success will depend on how well Soldiers can recognize the significance of accumulating information in relation to unfolding events and on their ability to integrate relevant information into a situational awareness that can support effective decisions and actions. Conversely, Soldier cognitive failures in comprehension and decision-making in the face of an ever more complex information stream will be a critical bottleneck in the effective utilization of advanced battlefield technologies. The impact of physiological state (e.g., fatigue, stress, arousal) on cognitive and motor performance. 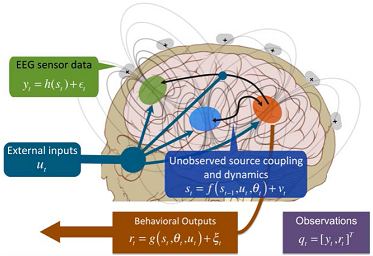 These understandings are fundamental to the development of systems that can exploit the natural properties of human neurocognitive and behavioral function to compliment and reinforce both individual and group operator abilities under dynamic and high information loads, as well as under circumstances of multiple objectives with differing levels of risk and reward. The restriction of experimental designs to highly controlled and impoverished stimulus-response paradigms and environments. The lack of portable, user-acceptable, minimally invasive, and robust systems for monitoring brain and body dynamics. The failure to record the whole of the behavior that the brain controls, and the physical and socio-cultural effects of the environment that impact brain function, in sufficient detail and across a sufficient breadth of circumstances.